Roads – Enter a city name to find roads in Japan. 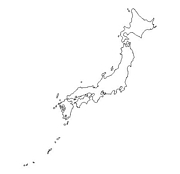 Weather – Click on the map, then choose a Japan province. Languages – This page has several in-depth maps of Japan. 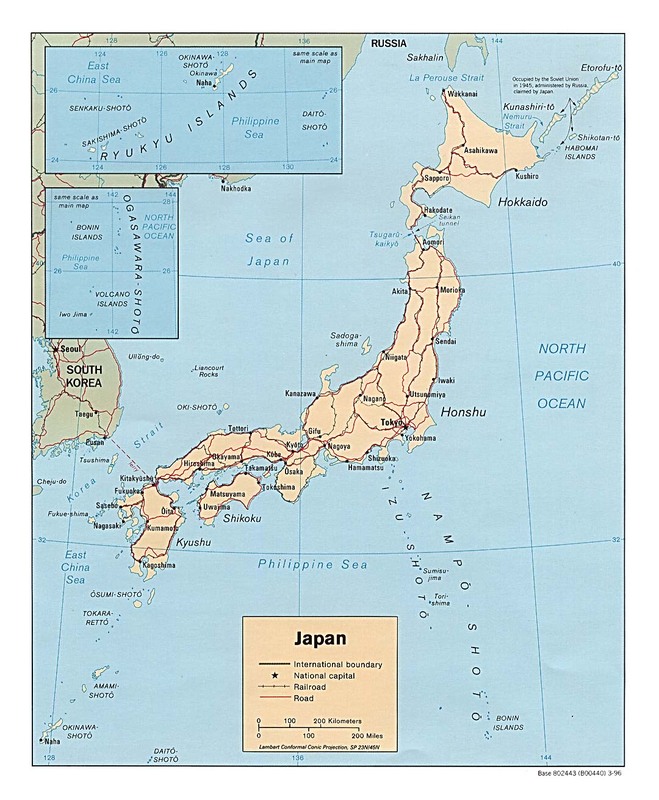 – Large high-quality laminated wall map of Japan. Exclusively developed by Maps.com and GRAPHI-OGRE and not available in any store, this wall map was created using high resolution vector digital imagery with state-of-the-art print on demand technology. Printed on 24lb. premium coated bond paper and laminated on both sides using 3mm laminate through a hot lamination process, this map is markable using dry erase pens and can be easily cleaned. Available in 3 sizes. 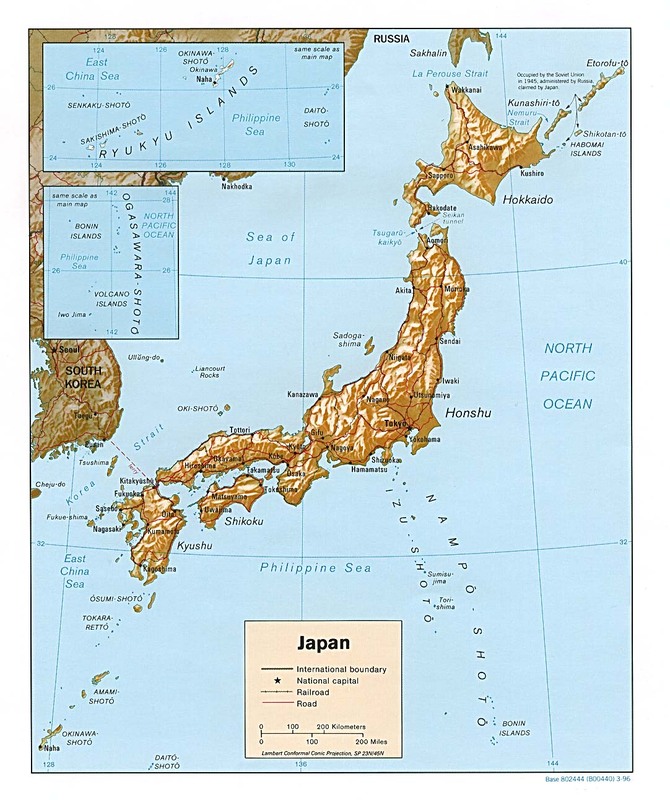 – National Geographic 22″ X 29″ map of Japan plain or laminated. At 145,833 square miles, Japan is slightly smaller than California. It’s in Eastern Asia, as an island chain between the North Pacific Ocean and the Sea of Japan, east of the Korean Peninsula. The terrain is mostly rugged and mountainous and the climate varies from tropical in the south to cool temperate in the north. The highest point is 12,389-foot Mount Fuji. The country’s population is 127,333,002 (2004 estimate). Ethnic groups: Japanese 99%, others 1% (Korean, Chinese, Brazilian, Filipino,). The religions are both Shinto and Buddhist 84%, other 16% (including Christian 0.7%). The official language is Japanese. The government type is a constitutional monarchy with a parliamentary structure. The country’s administrative divisions are 47 prefectures. It gained independence in 660 B.C. (traditional founding by Emperor Jimmu). 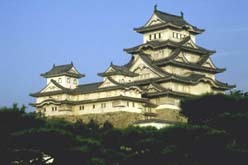 Government-industry cooperation, a strong work ethic, mastery of high technology, and a comparatively small defense allocation (1% of GDP) helped Japan advance with extraordinary rapidity to the rank of second most technologically-powerful economy in the world after the US and third-largest economy after the US and China. One notable characteristic of the economy is the working together of manufacturers, suppliers, and distributors in closely-knit groups called keiretsu. The country is among the world’s largest and technologically advanced producers of motor vehicles, electronic equipment, machine tools, steel and nonferrous metals, ships, chemicals, textiles, and processed foods.